A common problem in Eugene with all the rain we experience, is water buildup in areas of your yard. We have expert knowledge of yard drainage solutions. We love to solve yard drainage problems. Weather it be an old french drain that doesn’t seem to work, or a boggy lawn, allow us to evaluate the site and come up with a solution. We install a wide range of catch basins, sub-pumps, drainage swales, french drains and drain lines in an effort to re-route water. In addition to the immediate goal of re-routing water, we also make sure that each solution is aesthetically pleasing. After solving dozens of landscape drainage problems in Eugene Oregon, we are your local drainage experts. We are experienced yard drainage contractors in Eugene and have designed and constructed a variety of drainage solutions using the material below. If you have any questions or concerns about the cost of removing water buildup in your lawn or yard, or materials used contact us today! We are the leading yard drainage company in Eugene. Contact us if you have any questions regarding:. 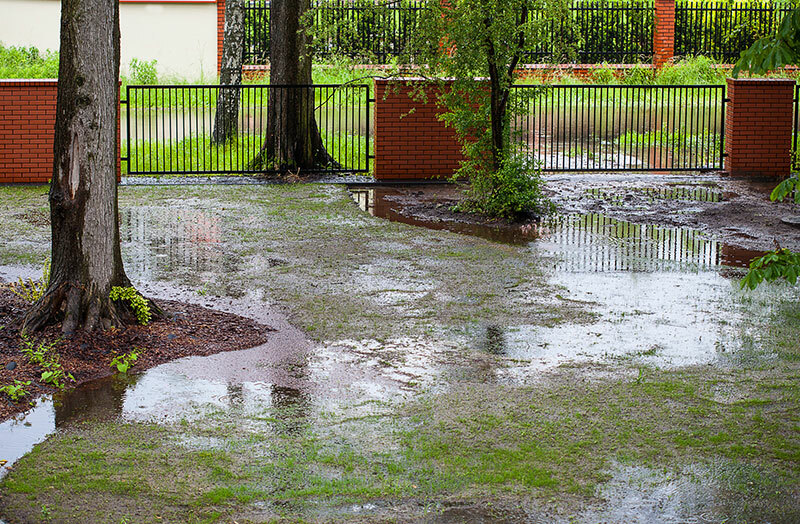 We have the equipment needed and the expertise to deal with drainage issues in your lawn.